Nationally recognized team helping business clients manage their most challenging issues related to benefits and compensation. Calfee's nationally recognized Employee Benefits and Executive Compensation practice group advises business and governmental clients on managing their most challenging legal and business issues related to benefits and compensation. In addition to extensive experience with tax-qualified retirement and employee health and welfare benefit plans, the group’s practice also has a significant focus on the design and implementation of sophisticated executive compensation programs, ESOPs, merger and acquisition matters, and ERISA litigation. Calfee represents publicly and privately held corporations, nonprofit organizations, banks and trust departments, and government entities in all phases of designing and administering employee benefit and retirement programs. Calfee regularly advises large employers and governmental retirement systems on designing and administering their employee benefit plans, including drafting plan documents and summary plan descriptions, administering claims requests and appeals, and negotiating with recordkeepers, third-party plan administrators, pharmacy benefit managers and other service providers. In addition, Calfee advises clients with large pension plans and 401(k) plans on matters related to the investment of their plan assets, such as investment manager and advisor arrangements, investments in private equity and hedge funds, transition management arrangements and compliance with regulatory requirements. Our Employee Benefits and Executive Compensation group is consistently recognized by Chambers USA, America's Leading Lawyers for Business, an industry-leading legal resource for professionals in search of qualified, experienced legal counsel. In 2018, Chambers USA researchers reported that Calfee's Employee Benefits and Executive Compensation group is known as a "respected practice that works with a wide range of clients, including nonprofit organizations, public entities and private corporations. Areas of expertise include issues such as employee benefit and retirement plans...[with] noted capabilities in ESOPs, ERISA litigation and M&A issues." Calfee was selected for inclusion to "Best Law Firms" Employee Benefits (ERISA) Law and Litigation – ERISA (National Tier 3) by U.S.News–Best Lawyers in America 2019. Hartzell Propeller Inc. / Tailwind Technologies, Inc.
RPM International Inc., and related companies, including Tremco Incorporated, Carboline Company, Day-Glo Color Corp. and Dryvit Systems, Inc., Rust-Oleum Corporation, DAP Products, Inc., and Zinsser Co., Inc. 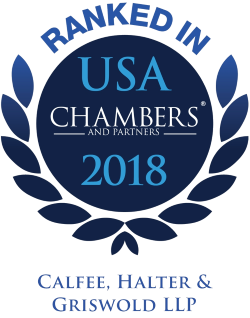 Chambers USA researchers reported that Calfee's Employee Benefits and Executive Compensation group is known as a "respected practice that works with a wide range of clients, including nonprofit organizations, public entities and private corporations. Areas of expertise include issues such as employee benefit and retirement plans...[with] noted capabilities in ESOPs, ERISA litigation and M&A issues."